Dec 1 – Double Header Program: The Story Finder: How to Create New Stories in Minutes! and Pitch to Win: How to Sell Your Products, Services and Yourself, in Minutes! Most presentations are invisible, boring and forgettable. They lack original material. If it’s not the PowerPoint Parade (one forgettable slide after another), it’s the Data Dump (one mind-numbing statistic after another). The only statistic people care about during this type of presentation is when will it end! 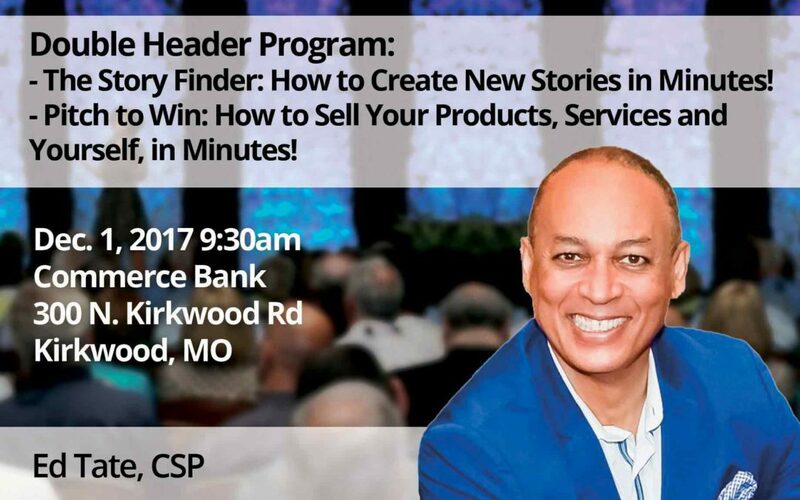 • Be the one that your prospects and clients look forward to seeing again and again! • Make buyers put down their smartphones and pick up your business. • Create a 10-second hook! Grab and keep the attention of busy people in seconds! • Compel prospects to choose your product, practice, and services. • Create Sticky-Selling Stories that spread! Ed Tate is an award-winning international Keynote speaker, trainer, author, executive, and motivational movie star. Worldwide he is known as “The Speaker Who Energizes, Educates and Entertains.” To date, he has spoken professionally in 47 states, 20 countries and on five continents. Ed won the “American Idol of Public Speaking”; becoming the 2000 World Champion of Public Speaking – Toastmasters International’s most prestigious speaking award among its 332,000+ Global members. In 2008, Ed earned the Certified Speaking Professional (CSP) designation by the National Speakers Association. It is the speaking profession’s international measure of professional platform skill. It is an honor bestowed on slightly more than 12% of its members. As an author, Ed’s publishing accomplishments include four books, a public blog called “Key Notes” www.edtate.com/blog, and several additional learning resources.